The important thing to know about matching on existing proposals is that if you have renamed the Name or Purpose field to something else, IOM will still be matching on the value in that field, regardless of its name. Each field on a record has an identifier in the back end of the Raiser's Edge database, and it is this identifier that IOM is using to match on the field, not the name you see in the front end user interface. This hold true even if you have named another field "Name" or "Purpose". 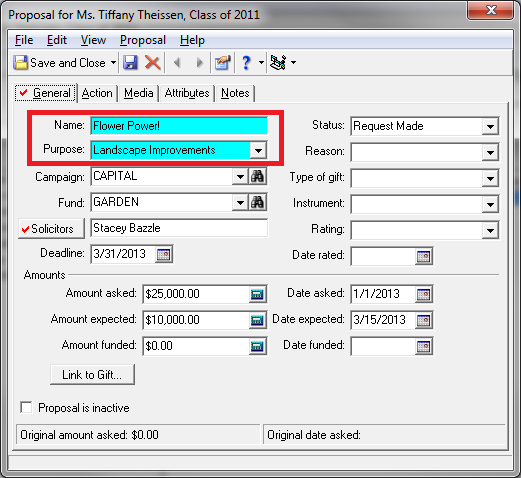 For reference, below is the default Proposal screen on a Constituent record. Proposal Name and Proposal Purpose are outlined in red. These are the two fields that are being used for Proposal matching, regardless of what you have re-named them to be in your database.